Egység,” or unity in Hungarian, is probably the word that best describes the past 10 days. One orchestra, made up of 103 different people, with different backgrounds and different stories, coming together to travel and perform, is a truly wonderful feat. Despite the inherent divisions that come with playing chamber music, such as the separate sections and the individual styles of the players, we all came together to share one thing with the rest of the world: music. Traveling around Eastern Europe, we’ve found division everywhere. Berlin was split up by the infamous Wall up until a few decades ago, and the territories of Poland were exploited by the Soviets and the Nazis during World War II. However, over time, these divides have been mended. Budapest truly exemplifies the qualities of unity. Up until 1873, the capital of Hungary was split into two cities, Buda and Pest. The two sides not only give the city its name, but also define its different lifestyles and personalities. During our tours of the two, the varying characteristics of each side were quite noticeable. 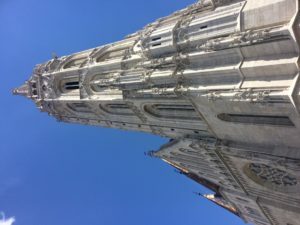 Buda, originally the aristocratic side, stands regally on the West Bank, sporting beautiful landmarks including the towering Matthias Church and the scenic Fisherman’s Bastion. Facing Buda, the historically poorer Pest lies flat, showing off amazing sights such as the Hero’s Square and the Hungarian Parliament. 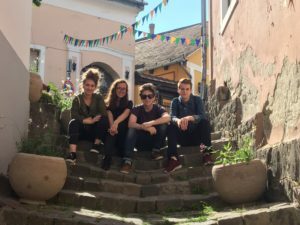 The charming small towns of Hungary, such as Szentendre, which we visited today as well, contrast surprisingly well with the more metropolitan areas of the capital city. 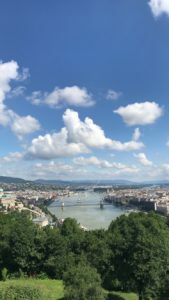 We were given the opportunity to witness these sights from numerous perspectives, ranging from the streets of Pest to the hills of Buda, and even from the flowing surface of the Danube, which divides the two. Last night, we glided under the bridges of the vivacious Danube on a river cruise. Today, we took a trip to the highest point in the city, where we saw Budapest from a completely different lens. Though the two old cities of Buda and Pest differ in structure and culture, they have come together to form one prosperous capital. In the same way, our small group of 103 has come together to form one cohesive unit of musicians. This sense of community can help us send a message to the rest of the world: despite our differences, we are one orchestra, one city, one united people.